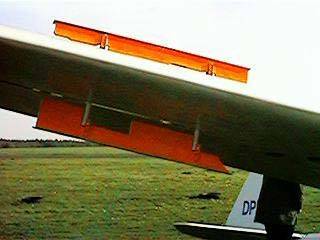 A DFS (Deutsche Forschungsanstalt für Segelflug) team led by Hans Jacobs designed the Meise in 1938 to fulfil the conditions for an Olympic class of sailplane to be flown by every nation’s competitors at the Olympic Games. Whereas the Hans Jacobs’ designed forerunners of the Meise during 1937/8, the Reiher and Weihe had needed much modification, the Meise seems to have been perfect right from the start.Together with the Akaflieg Munich’s contribution (designed by Ludwig Karch) the Mu 17, they both represented Germany before an Olympic Sailplane Selection Committee at trials for the Olympic sailplane at Sezze, near Rome, in February 1939. In spite of strong competition from the Polish Orlik and two Italian sailplanes, the International Committee selected the Meise. Some said that the Orlik was better and that the Meise had been selected because of strong German, Italian and Hungarian fascist influence in the jury. Whatever the truth of this is, nothing could have been superior to the Meise for perfect, light, aerodynamically balanced handling in flight.StructureThe Meise (after the 1939 trials named Olympia Meise) had a wing with main and secondary spars giving tremendous torsional stiffness, which made the cable operated ailerons very light and effective to use (there being no counter twist in opposition to aileron movement). The mass-balanced, trim tabbed elevator is also light to use, as so is the rudder. 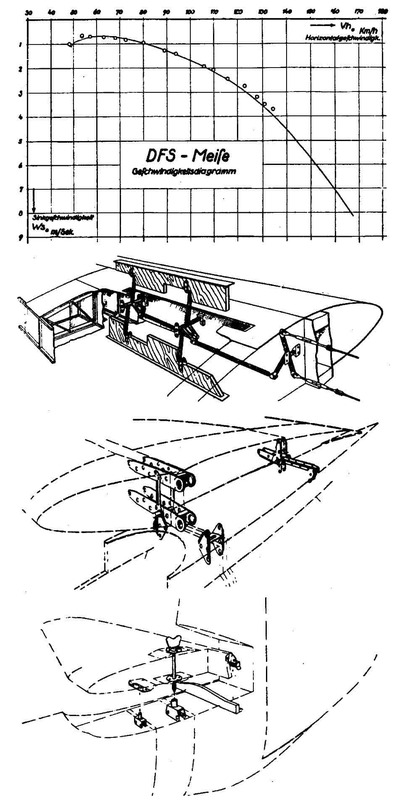 The three controls were harmonised to an extent never equalled by any other sailplane and became the standard, for many years to come, against which other sailplanes could be measured. 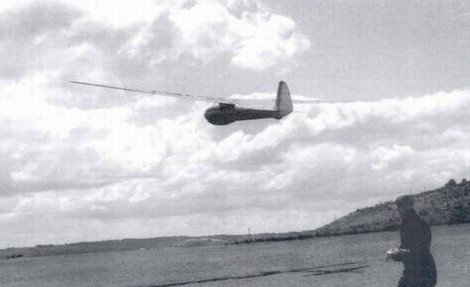 It was in fact the basis for the Standard Class Sailplane, as conceived by Lorne and Ann Welch and the No.1 Test Group at Redhill in 1947, and was, as this, paraded before all nations. The Meise has a semi-monocoque ply-covered fuselage, a classic torsion box leading edged wing and a tailplane with a minimum area stressed torsion box leading edge. 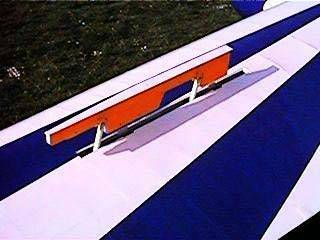 The tailplane was the weakest link in the chain, in that it would break first during negative G manoevres, such as rolls, inverted and very fast flying, for which the aircraft was never stressed. Although the ‘Meise was conceived as a very cheap to produce sailplane before the war (with cheap craftsmen everywhere), it certainly was not cheap to produce with post-war labour costs. 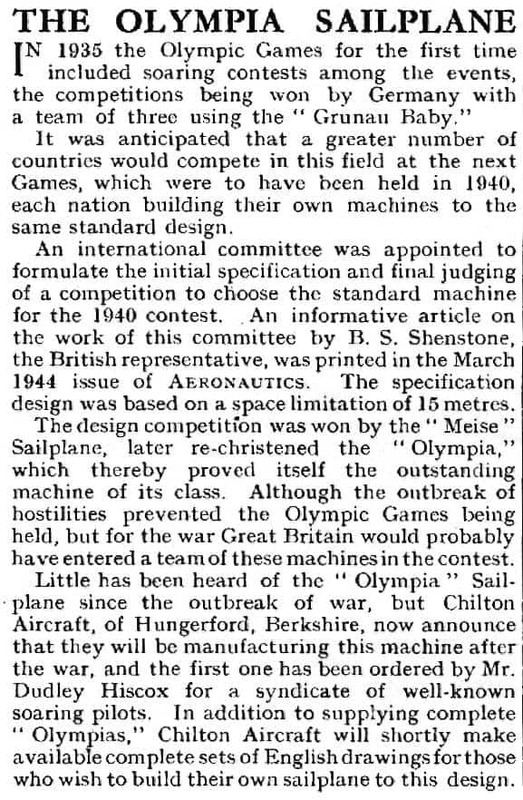 Unfortunately the 1940 Olympic Games in Helsinki, for which the Meise was destined, never came off due to outbreak of war. During the time before this, Seff Kunz, who,. 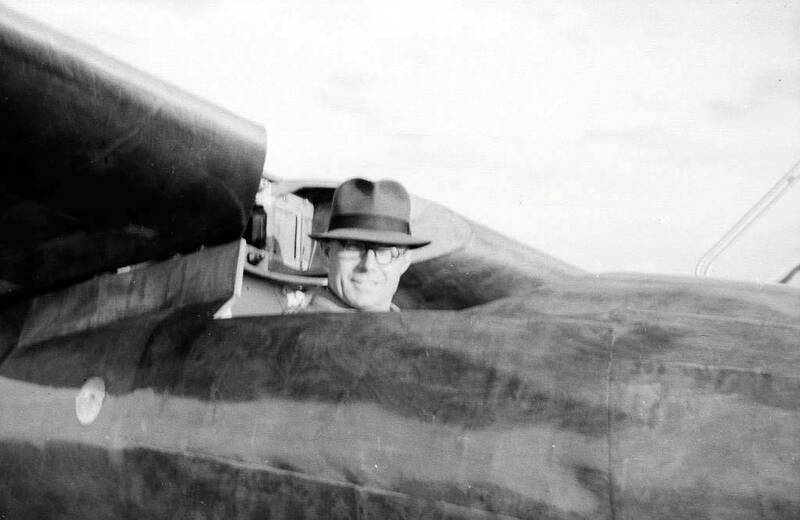 as an NSFK Standartenfü’hrer (Colonel) and brilliant organiser of the 1938 Rhön Contest, flew a Meise 348 kms to a goal in 1939. Kurt Schmidt may have flown his Mü13 over 480 kms on the same day but it was still a good performance. Seff Kunz failed to get gliding into the Olympic Games but became President of the West German Aero Club for many years after 1951. However, in anticipation of post-war participation in the Olympic Games, DFS sent out the Meise’s drawings to all countries in 1939, so that they could start building it. This did happen during the war in Sweden, Hungary, Switzerland and Yugoslavia, and post-war, in France, Britain and Australia. It can be said that, with the German wartime production of over 625 Meises, it achieved fourth place, after the SG 38 (9,500 factory built only), Grunau Baby 2b (over 4,000 factory built only) and Kranich 2 (1,600 factory built), in the grand totals of gliders built during the war. 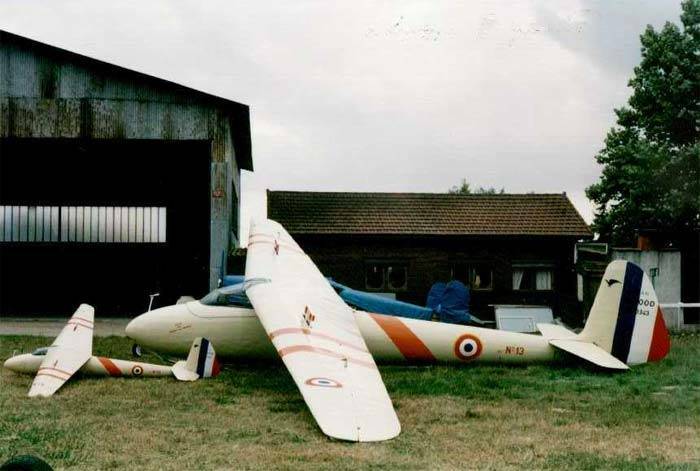 As 150 more were built in Britain after the war, and 100 more in France in 1947, it can be said that the Meise never became the Olympic sailplane, but it became the passport for glider pilots in many countries to leave their club sites, for the first time, to learn the art of cross-country soaring. No other cross-country sailplane had ever been available in such quantity before. It’s very effective 1939 Schempp Hirth (Hütter) divebrakes made it ideal for landing in small fields and would restrict its speed to a safe maximum during cloud flying, if necessary. 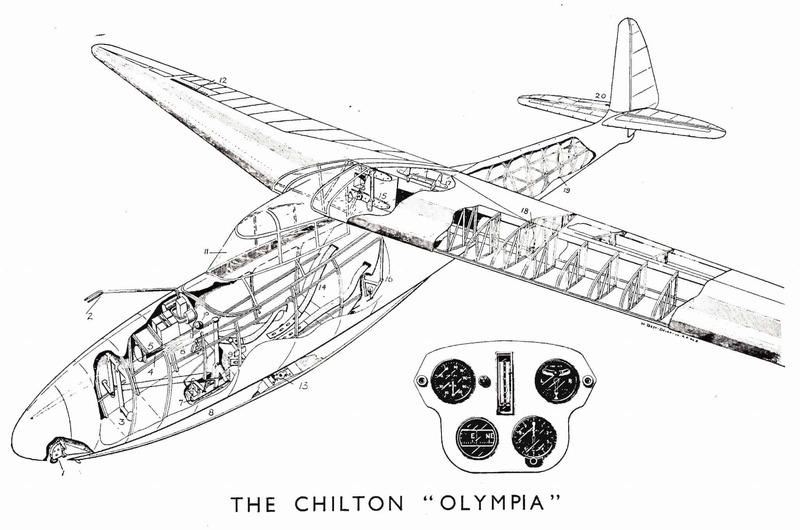 Already during 1944 information appeared about the post-war production of the Chilton Olympia. This was a small firm near Hungerford in a large estate. which built small and the ideas of financial profit were not considered. 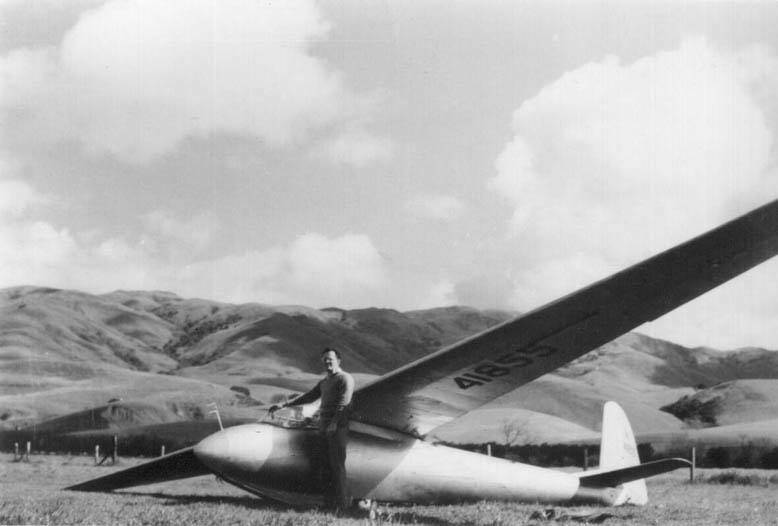 The firm had already produced plans for a small sailplane called the Chilton Cavalier, as it was thought that nobody would be able to support power flying after the war. 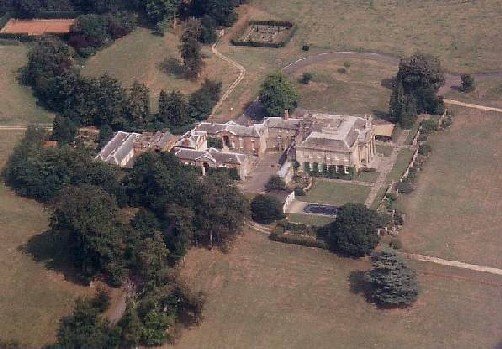 It seems that Dudley Hiscox, a renowned glider pilot att the time, originally brought Chilton the drawings of the Meise, and sold them the proposition of building it post-war rather than the Cavalier. Thus, it fell to our old friend and member, Harold Holdsworth, to start construction of the first British Olympia in the very limited space of a converted chicken house on the estate, for Dudley Hiscox.The Meise drawings from Germany were not very detailed arid thus, new Chilton Olympia drawings were created during which the Meise was somewhat altered for cheaper production. There was also a great row as to whether the drawings should be Metric or in inches. The final drawings at Elliots were in inches and 1/10ths of an inch.These in decimals of an inch were apparently acceptable to British aircraft practice at that time. It is also certain that the final Elliott drawings were from a firm of aircraft consultants, previously used by Chiltons, called A and EP who certainly re-stressed the Meise for British airworthiness conditions. “The first Chilton Olympia Sailplane from Chilton Aircraft Ltd of Hungerford was flown with complete success on Saturday at Theale by Mr. Dudley Hiscox for whom the machine was made. The machine was conveyed from Chilton to Theale where it was assembled in the hanger under the critical inspection of a number of gliding enthusiasts who expressed admiration for the high quality craftsmanship and superb polished finish. The first flight of the Chilton Olympia sailplane. Winch launched with the ready assistance of the local ATC, under their commanding officer, F/Lt Dunn. She took to the air with consummate grace. Later Mr. Hiscox expressed his gratification at the ease with which she could be handled. The Chilton Aircraft Co. feel that their confidence in the internationally famous sailplane has been abundantly confirmed by Saturdays performance and this was enhanced when it was learned that on Sunday Mr. Hiscox flew the machine from Theale to his pre-determined destination at Dunstable. The firm have a long order list for Chilton Olympians which include some for Australia, South America, Denmark and Iceland. 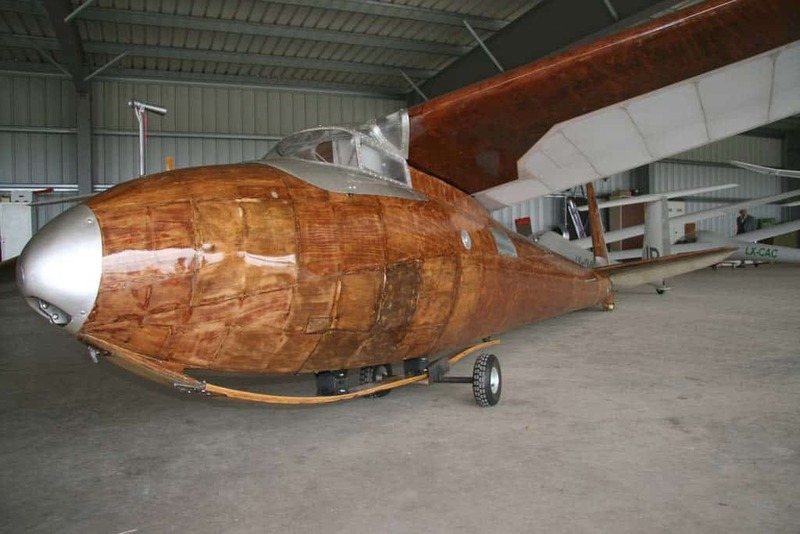 The Chilton Olympian is a graceful high wing monoplane of 50 foot span of wooden construction and is fitted with a comprehensive set of instruments for cross country flying. The machine can be launched either by winch or by aero-towing and lands on a streamlined skid with rubber shock absorbers. The Olympia prototype received the Chilton Aircraft serial number CAH/OL/7, later under the Elliotts numbering system it received the serial number EON/O/030. 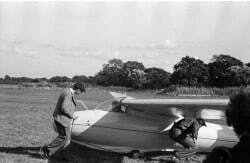 It was registered BGA 434 and received its British Gliding Association Certificate of Airworthiness in June of 1947, having made its first flight from White Waltham on the 17th January 1947, price in 1947 was £495. The Chilton Olympia was later sold to Eire where it received the registration IGA 103. 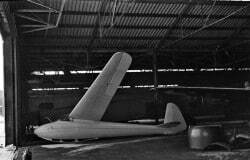 It was bought to the Slingsby Sailplane workshops in Yorkshire in a damaged condition on the 8th July 1967 for repair, but was found to be suffering from partial glue failure. The canvas topped trailer in which it was stored was damaged by gales during the winter of 1968-9 resulting in the Olympia becoming waterlogged, it was subsequently dumped behind a hanger in the summer of 1969 after its trailer had been sold, sadly this further exposure to the British climate rendered it beyond economic repair and it was finally burnt in January 1970. Although only one half Chilton Olympia was built in Britain, copies of the drawings went to Australia where three Chilton. Olympias were at least started. 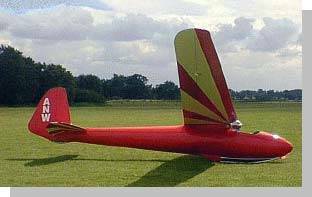 One of these, the “Yellow Witch” was finished with great difficulty by Arthur Hardings and was flown on a 500 km triangle by its owner, Keith Nolan. 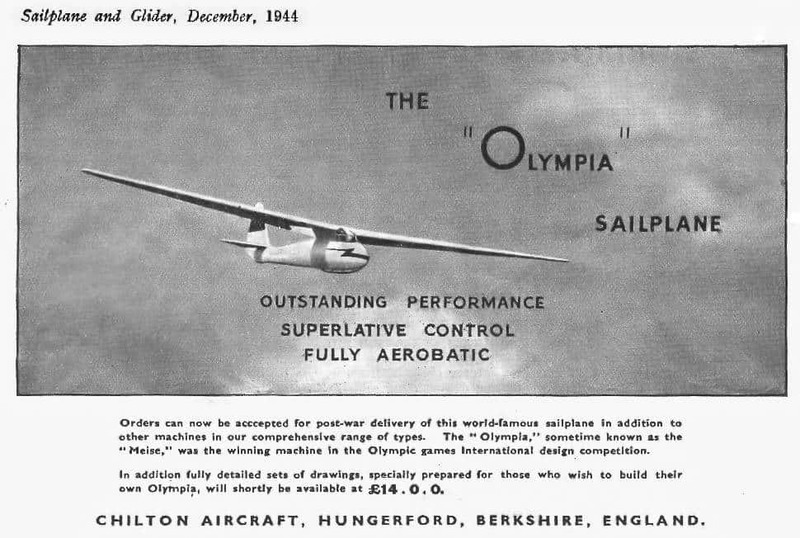 This was the greatest flight ever achieved by an Olympia and one of the greatest ever achieved by pre 1945 designed gliders. It would seem that, as Chiltons had done most of the groundwork, the entire labour force was put to building 100 Olympias, and parts for 100 more, with incredible war-time production speed (but with rather better quality) so that the first 100 aircraft were ready in 1947. Unfortunately, the British gliding movement was not large enough to quickly absorb such a large number on offer to them at the incredibly low price of £425, so that, when the author worked at Elliotts in 1953, approximately 40 of the first 100 Olympias were lying primed in racks awaiting sale. 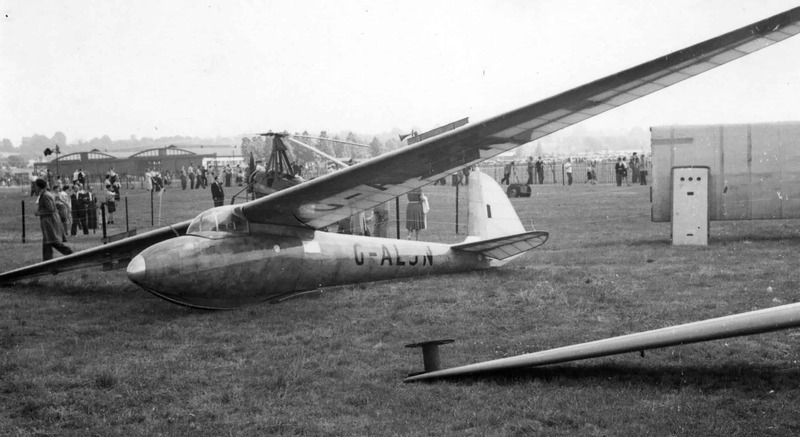 It would seem that during initial production, one of three German built Meises at Farnborough arrived for examination and Mr. McCaroll, the chief draughtsman, was sent on an unofficial gliding course in Germany with the RAF, to find out quickly all about the subject (as Peter Shaw did at Slingsbys in 1936… ). Although by 1953 Elliotts were employing 500 workers, displaced persons from the camps, and women and children, the labour was still not cheap enough to produce one Olympia at the cost price of £800 in 1953. Already, after unsuccessful sales in 1947, most of the firm’s labour force and drawing office staff had been transferred back to furniture making, which was what the firm did pre-war. By 1960, 50 more Eon Olympias had been built. This made Britain second in Olympia production to Germany in the world production table. This was hastened in 1953 by precut parts being fitted into jigs which were then put into two electrically heated presses, which caused the Aerolite glue to set in 79 minutes. These could be used for bulkheads and ribs. The cleaned up items were then assembled on final assembly jigs. After 1947, most of the workers were put to producing old style furniture for the postwar housing boom, with ultra modern equipment. This achieved the sale of between £7,500 and £13,500 of furniture a week. There was no hope of matching this income with glider. production and so, this was continued on a small scale (as a hobby) by about 15 men and boys, with girls employed on fabric covering work. 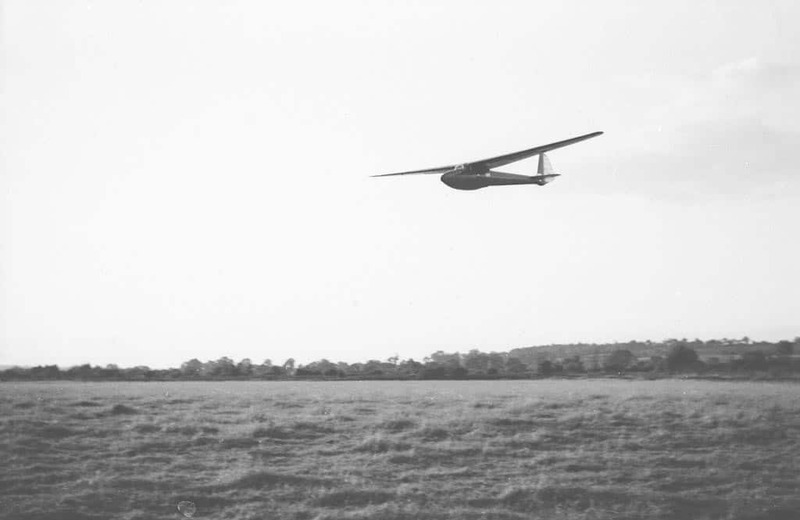 After 1953, the firm finished 50 Olympias, repaired many others, built the Ka 1, arid embarked on the Olympia 4 series of gliders, the 419 type being the best and highest performance sailplane available to British pilots for many years. Unfortunately, the excellent Olympia 460/315 sailplanes had to compete with Ka 6’s arid so, only 47 were built. The second batch of Eon Olympia sailplanes was still being offered for sale for £800 as late as 1957 in order to clear the spare parts held by the firm. ts performance testing was carried out by BGA Test Group No.3 at Nymphsfield. Whereas No.1 Test Group at: Redhill carried out the performance tests on the German built JS Weihe (BGA 448) and found that it came well up to, if not over, the German claimed figures of a max. L/D of 1.29, BGA Test Group No.3 found that the Eon Olympia’s performance did not come up to the German claimed Meise’s figures by three points. Moreover, the Eon Olympia would spin if incorrectly flown and was to be soared at 38-42mph. The minimum speed at which it was ever supposed to fly was 34 mph. A hand-made postwar built German Meise was found not to have entirely stalled at 24 mph but. this does not mean that wartime factory – built German Meises were as good as this, but they still handled immaculately. The Eon Olympia was basically stronger and heavier than the German Meise. 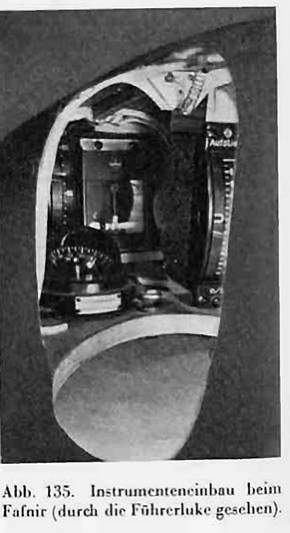 The Eon Olympia 2 had a built-in land wheel. The Eon Olympia 3 had a jettisonable take off, and ground handling, dolley, the pin which secured it being fired out by a spring. Several modifications were carried out to later Eon Olympias. One of these was a forward tailplane/fuselage attachment bolt. The tailplane, being a weak point, was never supposed to have its torsion box L/E lifted during ground handiing. 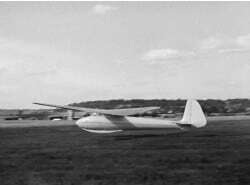 During the period 1947 – 1957 at least 13 x 300 kms flights were carried out by Eon Olympias. On August 24th 1950, the Farnborough test pilot, Bill Bedford, gained the British distance record by flying an Eon Olympia 193 miles in 230 mins. . During tile same flight he broke national gain of height and absolute height records, 19,120 ft. and 21,340 ft. respectively. Later, on the 2nd of May 1951, he broke the distance record again with a flight of 257 miles from Farnborough to Newcastle. Charles Wingfield had already broken the British out & return and distance records with an Eon Olympia by flying 147 miles and 216 miles but this was from Michita Falls in the 1947 US National Contest. The absolute moment of glory came on the 18th June 1960, when Cordon Rondel ascended with an Eon Olympia in a thunderstorm to 30,580 ft. with gain of height of 29,100 ft, for the absolute National height and gain of height, records. Thus did the Eon Olympia win back its height records. This firm was already building several German types at this time. These were the Nord 1000/2 Pingouin (ME 108), the Noralphs and Norecrin (ME 208) and Nord N.1300 (Grunau Baby 2b). When they received the Meise drawings is not known but 100 Nord N.2000s were completed in 1947. 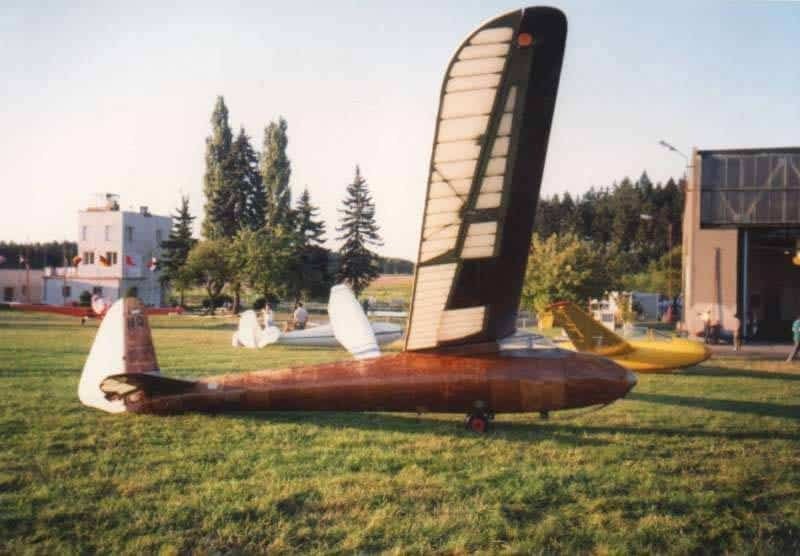 As they are casein (Certus) glued, they did not share the fate of the kaurite glued German gliders which were destroyed during the 1960s, and many of them are still airworthy now (1985). We also have no complete information about the flights they have carried out in France, except that on l0th May 1949, the 18 year old M.. Weiss flew one 490 kms from Pont Saint Vincent, near Nancy, to Masserett near Limoges, on the second cross country flight after his Silver C. Another flew from Saint Auban in France to Italy, over the Alps in the hands of the glider maintenance engineer Felicien Noin. The welcome he received from the Italians was rather better than that he received from the Chef du Centre, as he had departed without permission. This was the 20th August 1953. On the 27th May 1954, Jean-Paul Weiss flew an N.2000 from Saint Cirons in France over the Pyrenees to the Spanish gliding school of Huesca-Monflorite. Unfortunately, we have no distances for these two epics. A Hungarian 22 year old wartime glider pilot hero, Meray Horvath Robert flew a Meise on the 1st August 1944 in a thunderstorm to a Hungarian height record of 5778 m.
500 km triangle by K. Nolan, Australia – Chilton Olympia. Over 30,000 ft. by C. Rondel, Britain – Eon Olympia. It would seem that, if we are to believe the wartime German figures, over 1,000 were built, most of which were destroyed in 1945 by Germans, displaced personss Americans and British, the latter two adhering to the Morgenthau Plan. Many were taken to France, four being still airworthy in 1950 (Guy Borge thinks). A recent catalogue reveals that the Ferdinand Schmetz Flugzeugbay was prepared to sell whole major components to replace those broken. and components of parts, etc. Such was the advanced production state, after 1941. The much loved Olympia, N.2000, Meise, may not have achieved the Olympic Games but she had not done badly. Maybe her history is not over yet for no, less than 50 Eon Olympias still had BGA CofA’s in 1985. Nord N.2000 are being kept and restored all over France. Meises, mostly built after 1950, are still flying in Germany. One more is in Hungary. A Fokker Olympia is flying again in Holland and a Meise is still flying in Sweden. Meanwhile, the famous Chilton Olympia “Yellow Witch’ is still airworthy in Australia, as are other Olympias there. Captain Mike Russell of Peddars, Henham, Bishops Stortford, Herts. Is storing the building drawings, and prints for Eon, Chilton and DFS Olympias. These tests on Weihe, Eon Olympia and Gull 4 sailplanes were carried out as part of a contract placed with the British Gliding Association by the Ministry of Supply for flight testing a number of British and foreign designs. No.1 Test Group at Redhill tested the Weihe and Gull 4. No.3 Test Group at Bristol tested the Eon Olympia. The Weihe was JS built (BGA 448) in 1943. The aircraft were standard factory built sailplanes with no special sealing to improve aerodynamics. They were kept clean but were not polished. Three Eon Olympias were tested. Two of them had landing wheels. The third was a MK.I with landing skid. One of the wheeled Olympias had taken part in the 1948 World Championships at Samedan, Switzerland, being flown by Lorne Welch of the British Team.Calm conditions in early mornings and late evenings were used for the tests. Type Min. Sink. Max. L/D. 1. we wonder why the Eon Olympia’s max. L/D was tested at 49 mph? 2. It is a pity that the Olympia could not have been tested by No.1 Test Group since they had achieved results for the Weihe comparable to those obtained by the Germans (i.e. the right max. L/D at the right speed). We wonder if this was not an attempt to boost the new British designed Gull 4, but even the figures claimed for this were inferior to those claimed by the Germans for their Meise. The whole question of max. theoretical and max. practical, and claimed L/Ds comes again to the fore. One remembers the time when a Kranich 2 was comparing well in a competition during glides against Pirats and Skylark 3s, etc. (l/23.5 claimed for the Kranich and 1/31 and 1/36 claimed for the Pirat and Skylark). We must remember that the French gave the Olympia and Weihe max. L/Ds of only 22.8 and 22.2 respectively (and the AIR 100 1/25). It is difficult to understand how the French could conceive that their Olympia could have a better performance than their Weihe (VMA 200 Milan) but were they also influenced by trying to sell post-war national products? At that time the French had their AIR 100s as well as 15m span machines. Their figures for N.200 and Milan come from AVIASPORT.